The students from the Rutgers University in New Jersey, USA, visited Friends of Vrindavan office to get the knowledge of FoV’s Vrindavan Conservation efforts. The group was headed by Dr. Satyanarayan Das ji Maharaj, Director of the Jeeva Institute. The FoV activities were shown to the students through the power point presentation by Jagannath Poddar. The students were told in length about the Mission of the organization. The activities taken under the programme of Vrindavan Cleaning Fund, the Sacred Grove Conservation & Revival Programme, Bio-Medical Waste Collection services and the recycling projects, were explained to the visitors. Different environment related issues of Vrindavan were also discussed after the presentation. Some students expressed their desire to be associated with FoV in strengthening its mission of serving and protecting the environmental cause of Vrindavan. 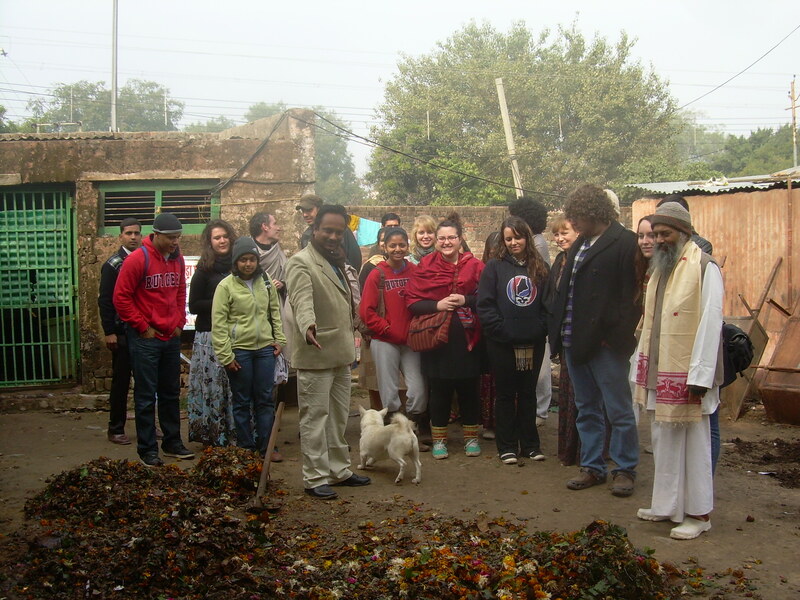 The students were demonstrated on how the organic manure is being made from the bio-degradable waste. FoV’s Programme Associate Nootan Sharma told the group that it needs 45 days cycle to make the organic manure. He told that the used flowers, garlands and other bio-degradable ritual waste of the temples are brought to the composting site for recycling. Programme Manager Ms. Madhumita Sharma showed the paper recycling plant to the students. She introduced the students to the women working for the project. The women demonstrated the basket making skills to the students. The baskets are made from the used plastic carry bags wrapped in straw by the threads taken out from the used cement bags. Dr. Satyanarayan Das, Director of the Jeeva Institute said that he is very much impressed with the efforts of Friends of Vrindavan. The Jeeva Institute has been supporting FoV’s effort in time to time. He said that the time has come when everyone should join hands with the efforts of FoV to bring back the environmental glory of Vrindavan.